enus Cellagen delays cellular changes associated with aging skin, using powerful ingredients such as immortelle/everlasting essential oil. When used daily, a blushing youthful complexion can be maintained or restored indefinitely. Venus Cellagen contains plant based collagen which penetrates deep into the dermis and encourages a rich supply of new collagen to discourage wrinkles and discolorations. This cream counteracts the effects of sun damage and hormonal changes. New collagen fills up wrinkles and tightens skin giving it a new sheen and radiance restoring skin tone and elasticity. There is no burning, redness, peeling or increased sun sensitivity. Instead, skin feels moist, smooth and supple. This product is a winner for every skin type, even those with rosacea, sensitive or dry skin. There are absolutely no parabens, sulfates, artificial parfums, dyes or other chemical additives that can cause allergic reactions or have long-term negative side effects and... safer for animals too since our creams do not contain animal by-products and are not tested on animals! Venus Cellagen Cream was formulated from the ground up with a luxurious aromatherapy base cream that is very gentle on the skin. The cream contains a luxurious combination of essential oils, organic shea butter, rosewater and emulsifier waxes derived from coconut and palm oils. Other ingredients such as avocado and apricot kernel oils have been added to make this cream one of the best anti-wrinkle creams sold anywhere. It is also more effective and more gentle on your skin than creams containing mineral oil or other substances that block skin pores. To the aromatherapy base cream powerful anti-aging ingredients were selected and added, including essential oils of immortelle/everlasting, frankincense, neroli, clary sage and myrrh. Additional ingredients include borage seed, avocado, rosehip, calendula and olive oils, making this cream into a powerful combination to fight the ravages of aging skin (see the complete list and descriptions below). Go Green  by buying green, that is, buying alternative natural products such as Venus Cellagen you will be helping save our environment and our planet! elichrysum Italicum is the scientific name for a species of herb which grows in the area of Italy and the Balkans. 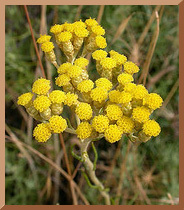 The common name for this herb is immortelle or everlasting, named thus because of its (the flowers) ability to retain its golden-yellow color even after being dried. The name helichrysum literally means gold sun in Greek. This specific form (italicum) is the most potent form for use in anti-aging products  it is also the most expensive form. The essential oil, obtained by steam distillation of the flowering heads, naturally combats the aging of skin. This flowering herb has the therapeutic property of encouraging the growth and regeneration of new skin cells, so is very helpful in fighting the ravages of aging. Its regenerating qualities assist in the healing of many skin conditions. Plant Based Collagen (yeast derived extract trademarked as pseudocollagen), an ingredient that is contained in only the finest wrinkle creams on the market, being an ideal substitute for animal based collagen. Venus Cellagen does not contain wheat proteins or animal collagen as many are allergic to these substances. Organic Rose Hip oil (Rosa Mosqueta) is a rich source of essential fatty acids and is known for its healing properties. It comes from wild rose bushes of Chile, South America and is especially suited to treat damaged skin conditions such as burns, scars and stretch marks. Calendula (Marigold) herbal extract in pure virgin olive oil for its healing and skin regenerating properties. Borage Seed Oil is very rich in Omega-6 fatty acids which is responsible for making skin softer and more elastic, contributing to the skins youthfulness. Frankincense has been used for thousands of years in Egypt for skin care  for its rejuvenating and youth preserving properties, restoring tone to slack skin. Neroli oil is extracted from the small, white, waxy flowers of the bitter-orange tree by steam distillation and has a powerful but delicate, sweet floral fragrance. Nerolis soothing and regenerating properties enhance skin tone and is especially recommeded for dry, damaged skin. Clary Sage is steam distilled from the flowering tops and foliage of a tall perennial herb that grows up to 1 meter high with large, hairy leaves, with small purple or blue flowers. It is known to be effective in wrinkle prevention. Myrrh is the aromatic gummy substance exuded by certain trees and shrubs growing in eastern Africa and Arabia. It is rejuvenating, fungicidal, anti-inflammatory, antiseptic, cooling and an astringent. High quality carrier oils make for easy absorption and for extra therapeutic benefit to the skin and are selected for their healing properties and rich essential fatty acid content. These include apricot kernel and avocado oil. purified water (steam distilled), rose hydrosol (steam distilled rose water), borage oil, avocado oil, apricot kernel oil, rosehip oil, olive oil; calendula herb oil extract; plant derived collagen (yeast extract); certified organic shea butter, vitamin E; pure essential oils of immortelle (helichrysum italicum), frankincense, neroli, clary sage and myrrh; natural preservatives are grapefruit seed extract and heliozimt; natural emulsifiers (thickeners) are derived from coconut and palm oils. Venus Cellagen Cream is applied after cleansing and toning. Massage a small amount into face and neck using an upward motion. Use daily for maximum benefit. Venus Cellagen Cream is, in our estimation, the finest Anti-Aging, Anti-Wrinkle cream available anywhere at any price. As soon as you start using this cream, you will start noticing your complexion becoming smoother, more buoyant and youthful. With continued use, tell tale lines will be effectively reduced and wrinkles will soften and be much less noticeable. Evening Routine: I cleanse and tone using Venus cleanser for normal/dry skin and Venus toner for normal/dry skin. Then I apply Venus Anti Aging Eye cream around my eyes and Venus Fruit Acid cream to my face (avoiding the eye area). Finally, I apply Venus Andean Rose cream to my neck, chest area to prevent brown spots from sun damage. Morning Routine: I first rinse my face and neck with very cold water, pat dry with a towel and wipe off excess oil with the normal/dry toner. Then I apply Pycnogenol cream lightly to my entire face including the whole eye area, above and below. Then I apply Venus Cellagen to my face and Venus firming eye cream to the undereye area. Finally, I apply Venus Andean Rose cream to my neck, chest area to protect my skin from sun damage.